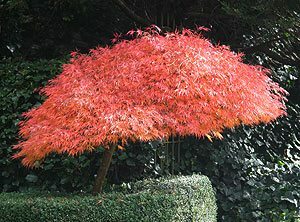 A truly versatile plant for any garden is the Dwarf Japanese Maple. They grow well in the garden itself and are also well suited to growing in containers. They come in a number of varieties and foliage colours. The final size will depend of how they are grafted or the variety. These low growing trees have wonderful foliage from spring to the end of summer and then the fantastic color change that autumn brings adds more impact as the cooler weather settles in. Size will vary depending on variety and the grafting height, generally from around 1m to 2m. All varieties have attractive foliage during spring and summer, some green and others through to red and purple. The type of foliage also differs with variety. Although most varieties have a weeping or cascading habit, some are upright while other almost form a ball shape. They are excellent plants for most garden styles and grow well in containers. An excellent form with finely dissected foliage. As the name suggested the foliage is a nice crimson through spring and summer, turning to more reddish tones in autumn as the cool weather settles in. Red and green finely dissected foliage followed by red and orange in autumn. Green five lobed foliage, deeply incised, brilliant orange to red tones in autumn. This variety reached around 2m in height. Very finely cut leaves, slow growing but with brilliant scarlet red autumn foliage. An unusual upright growth habit. Burgundy foliage. Very small foliage on a upright dwarf bush. An unusual form of the vine maple. Green foliage in a tightly help rounded bush to around 1m in height. Generally it is thought dwarf maples require no pruning other than the removal of any dead or damaged stems. This is true for the first few years, and then they do benefit from pruning. Besides removing dead wood it is best to also remove some of the cross over branches and ‘open up’ the tree a little. This lets light into the tree which helps prevent disease and dead wood. It also stops the tree from looking like a blob of foliage, it gives structure that looks great through the season as well as looking good in the winter. Sometimes they are trained to grow on a slant, especially in Japanese style gardens. This gives them a windswept look. Actual height is not determined by pruning, it is set by the height of the graft, some are grafted at 1m, some at 2m and others at 3m. Full sun to part shade – protection from hot afternoon sun, but not deep shade.